Hi Frank. Congrats on your awesome arena shows in the UK; it's been hella fun reading about them here on the US West Coast. And thank you for turning me on to this awesome Weatherkings song on your latest release. 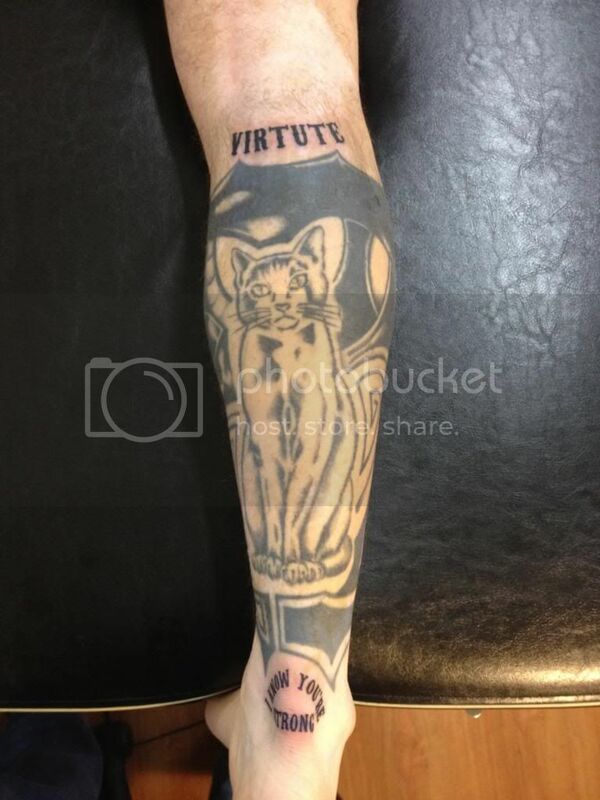 I'm going to see if I can work Virtute into the existing cat tattoo on my leg. Quick question: The follow-up by the Weatherkings left me extremely bummed out about poor Virtute's fate. Would it be cool for you to write a follow up? Vitutue and her dude really need to get back together! Ha. Maybe. It's John's song tho.. 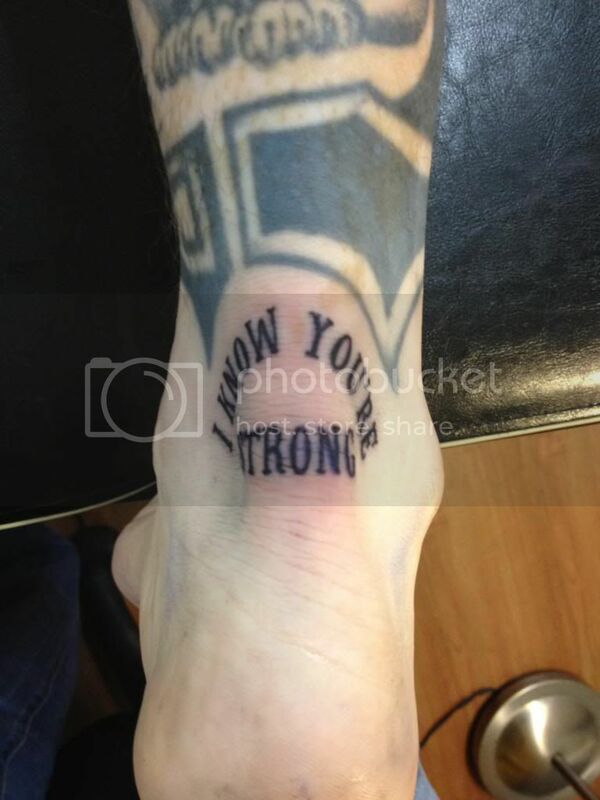 I'd have some cool pics of this new tattoo text if I could figure out how to post them. A little help anyone? Thanks. 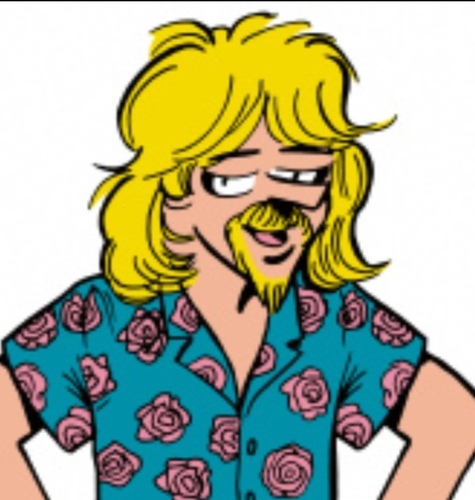 (img)insert link to image here(/img) use square brackets instead of round ones. Here it is; a cat now named Virtute. New text added to an old tattoo. Thanks for the help Bobstains. Hi Frank. The version I first heard, and he one I like best, is the one on the Polaroid Picture EP, mostly because I feel the last line (newly tattooed across my Achilles tendon, yowsers!) comes off way better as a refrain and not just the one time as in most versions. Which show was that from? It was recorded on Winnipeg at the end of last year. I seriously need a third song about this darned cat. What happens to her?! I've been wondering for about four years now. Can you put the thumbscrews to the Weakerthans to release an album...or at least give you a song to play? Someone synced audio and video of our live @theweakerthans cover, which is cool. https://www.youtube.com/watch?v=UQ4XL-p ... e=youtu.be"
ps I'm glad the copyright people let it stand. I synced your cover of Last Christmas with the original Wham video, mostly as a present for my friend Pasty, who introduced me to your music and has birthday on Christmas Day. That one got slapped down from youtube within twenty minutes on three different copyright infringements. greezy wrote: I seriously need a third song about this darned cat. What happens to her?! I've been wondering for about four years now. Can you put the thumbscrews to the Weakerthans to release an album...or at least give you a song to play? The song "17th Street Treatment Centre" on the new record is part of the Virtute canon too. So you got two new ones. 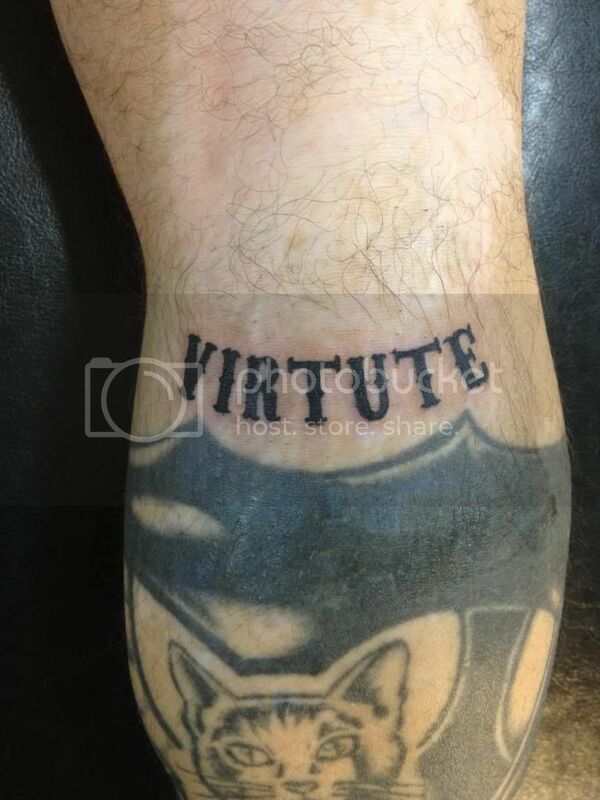 frank wrote: The song "17th Street Treatment Centre" on the new record is part of the Virtute canon too. So you got two new ones. Excellent, thanks for the heads up! Gonna give the album a proper listen tomorrow; today I'm binging on the mighty Murder By Death. I have to say the title of the final song gave me cause for concern. Looking forward to seeing you all on the same stages in January. Wow, the lyrics to Virtute At Rest are amazing. I am both awestruck and in tears over this song right now. It's such an appropriate ending to the story. Interesting interview here that mentions Virtute.